So, was the throw that Tony Stewart made with his helmet at Matt Kenseth after a wreck at Bristol Motor Speedway Saturday night a strike? Depends upon where Stewart was aiming, one would have to assume. For Kenseth, it was not a curve ball, however. He knew it was coming. Stewart warned Kenseth to expect more from him. Lots more between now and the end of the season. Stewart and Kenseth were up front and racing for the lead. And they wrecked. Stewart’s car was immobilized by the wreck. Kenseth kept going. As Kenseth was coming out of pit lane, Stewart was standing near the head of the wall that separates the pits from the track. Stewart grabbed his helmet with both hands, wound up and let go with the heater. The helmet made impact just to the inside side of the right headlight decal on Kenseth’s car. Kenseth pleaded innocent to doing anything worthy of being a beanball target. “I’m a little confused,” the Roush Fenway Racing driver said. “I was running the top leading and he got a run and he went into turn one like I wasn’t there and just went straight to the fence. If I wouldn’t have lifted, like he chose not to do the next corner, we would have wrecked, so I let him have it and I got a run back, drove all the way alongside of him and we just kept going. Stewart also revealed future plans. 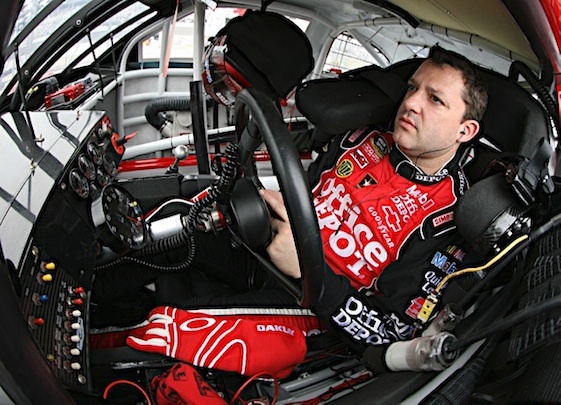 Stewart’s plans may change later in the week – on the day that NASCAR issues penalties. The helmet toss – made left-handed, by the way – could result in probation. Kenseth, informed of Stewart’s plans, issued a whatever to his new WFF. “Yeah, that’s fine,” the former Cup champion said. “Look, Tony is probably the greatest race car driver in the garage. I don’t really have anything bad to say about Tony. On the race track for years and years and years we’ve had tons of respect for each other and, for whatever reason this year, he ran me off the track at Sears Point and said he was sorry. Assessing things like “faults” and “problems” always involves personal opinion. The opinion here, from a former member of the Baseball Writers Association of America: While a bit low and to the outside, a definite strike. Stewart should really look at the tape before he blows off. It sure looks like he caused the problem. He’s a great driver but so is Matt. Stewarts problem is that he expects everyone to back off and let him go instead beating on him a bit. Good thing Newman is his team mate because he normally won’t give anyone any slack when they;\’re trying to pass! I guess Matt’s new home isn’t with SHR! It was just a racing thing. 2 cars trying to lead, and both too stupid to give a little with a lot of the race left. But to throw a hissy fit like Tony did is embarrassing, especially for the owner of a major team. And did you see the size of his gut? wow. No big deal, Go Daddy money will pay SHR for all that destruction. Matt is not right, he is never wrong when he wreaks people and if he looks at the tape Tony when down to go around him and then came up and gave him plenty of room.It proubly was both of their faults. Every body loved it when Tony threw the helmet, you could hear the cheers from the fans.